Since washing machines and clothes dryers go hand in hand, it was important for us to get something that matched our Maytag Epic (9800 series) washer. 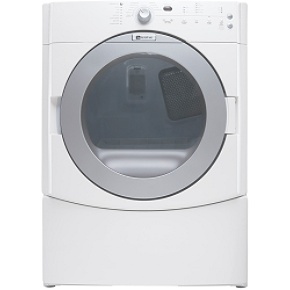 That's when we got the sister unit, this MAYTAG MED9800TQ electric dryer in white (to match our washer). So far we have loved this dryer, and all of the settings make it perfect for any sized load or desired dryness. I like the electronic controls on the front, instead of the turn dial that most older models have - it makes it harder for the kids to accidentally turn it on (especially with the control lock-out turned on). Since the door on it is reversible, we didn't have to worry about which side it would be on and if the door would need to be a certain direction. Also, it's nice and quiet, with only the end-of-cycle signal reminding us that it was on. It dries the clothes great, and because of the large capacity, we can fit pretty much everything we own in there. In fact, we're even saving a little money because we actually run it less, since the washer and dryer are so big. I've loved this dryer for the past year, and I would recommend it to anyone who?s looking for a good, quiet dryer that can hold a lot of clothes.